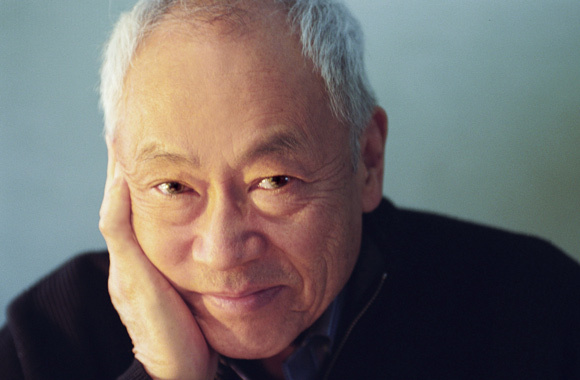 Renowned architect Gyo Obata was honored with the University’s Distinguished Service Award during the Saturday, May 6, 9 a.m. Spring Commencement ceremony. Unable to attend the event, Obata expressed his appreciation in a video. In 1955, Obata co-founded Hellmuth, Obata + Kassabaum (HOK), the largest United States-based architecture/engineering firm. In the early 1960s, Obata was commissioned to design the new SIUE. He conceived the idea of a centralized campus, likened to a small college square, with all facilities located within a circle. He designed each of the buildings to have three stories plus a basement, with flat roofs and maroon brick. “There were some objections, but I really wanted to keep the parking away from the main campus,” Obata said. “You have to park and walk to the campus. In the center of the campus is the library, student center, and the main administration building as a focal point. Out of that core, there would be groups of buildings depending on the different types of buildings as the school’s needs might go on. His many celebrated designs have local, regional and national prominence. HOK’s architectural designs are fixtures in the St. Louis area: the Planetarium at the St. Louis Science Center, the St. Louis Zoo’s Living World and Children’s Zoo, the St. Louis Abby Church’s Priory Chapel, St. Louis Union Station and the Boeing Leadership Center. Obata’s national projects include: Abraham Lincoln Presidential Library and Museum, Dallas/Fort Worth International Airport, National Air and Space Museum, and the Great American Tower at Queen City Square. 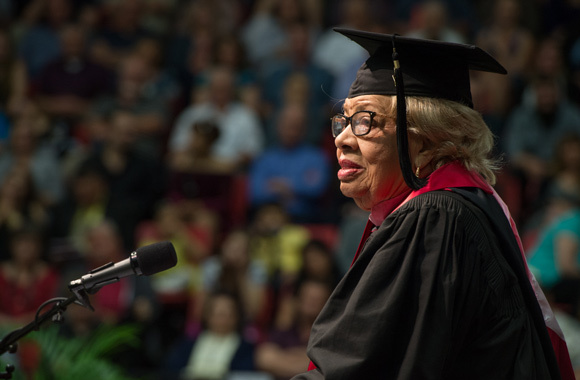 SIUE emeritus professor and former administrator Johnetta Randolph Haley was honored with the Distinguished Service Award during the Saturday, May 6, afternoon ceremony. The 94-year-old Haley proudly represented five generations of college graduates from her family. In an inspirational address that routinely drew applause and affirmation, she provided sound lifetime advice to the entire crowd. “The true power of the arts and humanities is that they speak to everyone,” she said. “We were trained to value education, and my parents always taught us to give back. Alton native Johnetta Randolph Haley became a member of the SIUE faculty in 1972 as an assistant professor in the Department of Music in the School of Fine Arts and Communications. She rose through the SIUE ranks to associate professor in 1978 and to professor in 1984. University President Earl Lazerson appointed Haley as acting director of the SIUE East St. Louis Center in 1982, and she became the director in 1984. Haley was named professor emeritus in 1993 upon her retirement. In 1994 shortly after Haley’s retirement, SIUE’s minority scholarship program was named the Johnetta Haley Scholars Academy in honor of her many contributions to the University and to the East St. Louis community. Read more about Haley and her numerous awards and accomplishments.